Nassau, Bahamas - Baha Mar has been rated one of the top ten destinations in the world to visit in 2015 by CNN Travel, as a new resort making a huge impact on luxury travel in the region. The $3.5 billion luxury gaming resort, according to CNN Travel, is “expected to send ripples across the Caribbean” when it opens in Spring 2015 with a grand gala produced by music and entertainment icons Jamie King and Emilio Estefan. Baha Mar is the only Caribbean resort to land a spot among the top ten destinations of 2015, ranking alongside other breathtaking locations including Milan and Abu Dhabi. Offering four distinct luxury hotel brands – Rosewood at Baha Mar, Grand Hyatt at Baha Mar, SLS LUX at Baha Mar, and the crown jewel, the Baha Mar Casino and Hotel, along with a renovated Meliá property, Baha Mar has also made the list of ’22 don’t-miss travel destinations for 2015’, according to the New York Post. The new ‘Bahamian Riviera’ shared this listing with other luxury properties around the globe, including Four Seasons Resort Oahu at Ko Olina in Hawaii, The Ritz Paris, Park Hyatt Zanzibar and Six Senses Qing Cheng Mountain in China. Gamers will delight in Baha Mar’s 100,000-square-foot Las Vegas-style casino which boasts the latest technology in gaming. Fifteen pools and TPC at Baha Mar, a signature Jack Niklaus golf course, allow guests to take in the natural beauty of The Bahamas. VIP accommodations include the Villa Roxie, designed by Kravitz Design, founded by Grammy award-winning artist Lenny Kravitz. 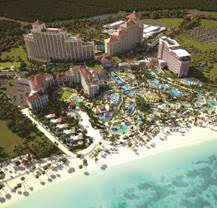 The 30,000-foot ESPA at Baha Mar pampers the senses while overlooking stretches of uninterrupted white sand beaches. The best of cuisine from around the world can be found in forty restaurants, lounges and bars, while high end retail offerings include top luxury brands.